Amtico's flagship brand pioneered a new product category that combines the look of natural materials with the unrivalled performance benefits. Amtico has over 40 years experience in designing, engineering and manufacturing flooring has led to an unrivalled collection of over 200 Wood, Stone and Abstract products which allows customers to create a truly unique floor. The range is exclusively designed for the home by Amtico International’s in-house design team and offers bespoke design for those seeking inspiration. There is a huge selection to choose from – choices for traditional, classic and contemporary interiors – that suit any room and any style. A range of coordinating finishing touches and borders are also available to create a theme or trims to add sophistication to a scheme. 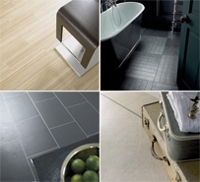 Amtico is suitable for all areas within the home and is water, slip and dent resistant. Also due to the unique Urethane coating Amtico is scratch, scuff and stain resistant. Amtico comes with a 20 year transferable guarantee against wear out. We asked Ox Flooring to Quote for some carpets and wood effect flooring. They were prompt, courteous and had a sizeable selection of samples for us to choose from. All were fitted well and at a competitive rate. We would have no hesitation in recommending them to others.